Himachal Pradesh Gramin Bank (HPGB) has declared interview result on 29th May 2015 for 38 posts of Officer Scale I, 28 Posts of Officer Scale II, 03 Posts of Officer Scale III and 134 Posts of Office Assistant (Multipurpose) on official website www.himachalgraminbank.org. A list of selected candidates has released based on the performance of RRB Common Written Examination III and personal interview. Himachal Pradesh Gamin Bank had called eligible candidates based on cut off marks obtained in RRB Common Written Examination (CWE III) which was held in September/ October 2014. 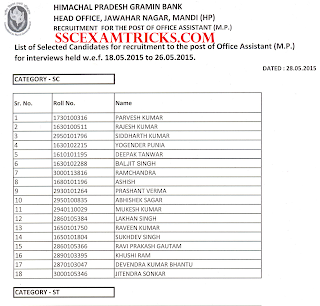 Himachal Pradesh Gramin Bank had conducted personal interview of the eligible candidates from 18th May 2015 to 26th May 2015. Finally, Himachal Pradesh Gramin Bank Interview Result has announced and provisionally selected list has displayed on official website www.himachalgraminbank.org. Earlier HPGB had invited online applications for registration from 07th April 2015 to 22nd April 2015 for total 203 vacancies of Officer Scale I, II & III and Office Assistant (Multipurpose). HPGB had 07th May 2015 as last date for reprint of application form. Those candidates who had qualified IBPS RRB CWE III (held in Sept / Oct 2014) had applied for these posts. 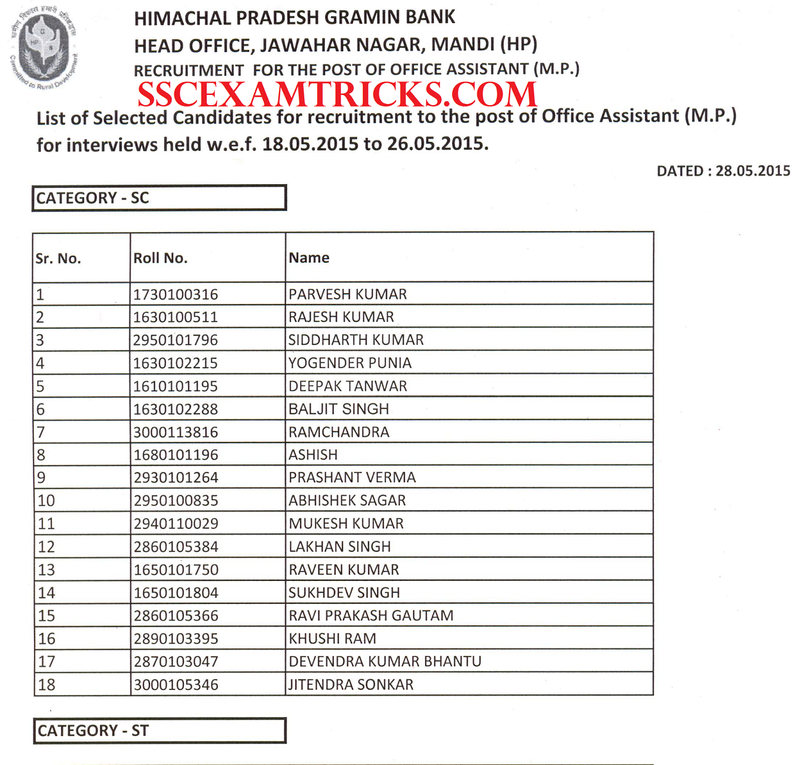 Himachal Pradesh Gramin Bank had shortlisted candidates called for interview. The interview was held at Mandi (Himachal Pradesh) for 30 marks by Himachal Pradesh Gramin Bank. Those candidates who had appeared in interview, they can check their Himachal Pradesh Gramin Bank Interview result 2015 from the direct link provided below. Based on cut off marks obtained in IBPSC CWE III, list of shortlisted candidates called for interview had released on the official website. Those candidates who had scored equal to or greater than cut off marks were qualified for interview session. The personal interview was held at Mandi (HP). Himachal Pradesh Gramin Bank had conducted interview for 30 marks. The personal interview was conducted with verification of original documents of the candidates at the venue of personal interview. The final allotment will be made in June 2015 (expected). The selected candidates will be recruited on CTC basis with the annual package. It is noted that the probation period for two years for Officers and One years for Office Assistant.